When you do almost all of your recording, correspondence, and communicating via computer, you might feel a bit lost when switching to a plain old ballpoint pen. There’s no squiggly red line to tell you when you’ve misspelled a word, for instance – and there’s no “backspace” key. 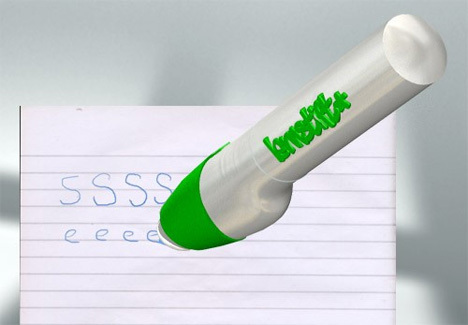 The Lernstift (which is German for “learning pen”) is a pen which aims to bring the art of handwritten correspondence into the digital age. 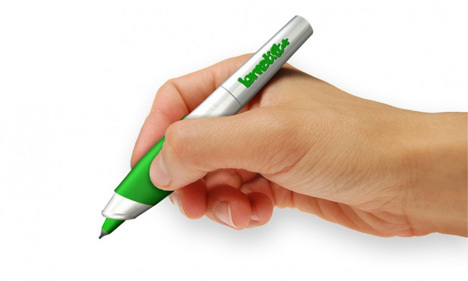 The pen senses when you’ve misspelled a word or when you are using poor grammar or penmanship – and it vibrates to draw attention to your errors. The pen networks with a variety of devices to keep track of your progress and problem areas. There are two modes built into the Lernstift: calligraphy mode tracks only the neatness and correctness of your handwriting. In orthography mode, the pen keeps track of your spelling and grammar errors. The pen even detects writing that is done in the air rather than on a surface, but there is a ballpoint writing instrument inside for when you feel like putting pen to paper. Both modes help kids or anyone else learn to write correctly, both in form and technical content. Obviously, a tool like this would be excellent for helping children stay on track with their spelling and grammar. This is especially important today since it seems like kids have all but given up on writing in favor of texting. See more in Digital Design or under Technology. February, 2013.